If you grew up in certain parts of the country, you've no doubt got some fond memories regarding fireflies. A cool summer's dusk, the stars just starting to be visible, the chirping of insects—and flashing lazily about, the lights of fireflies. Fireflies! the game has an exclamation mark in its title. That enthusiastic punctuation should be your first sign that this game is not exactly a deep, poetic rumination on the wonder of the Lampyridae, but something rather lighter. But while that is indeed the case, Fireflies! is also a sublimely simple and gratifying game, a soothing, addictive zen-like experience. It works like this: A bunch of differently colored fireflies (!) flit about your screen. You tap once, which illuminates a globe of light in the air. If a firefly touches the globe, it vanishes into its own globe of light, hopefully triggering other nearby fireflies. 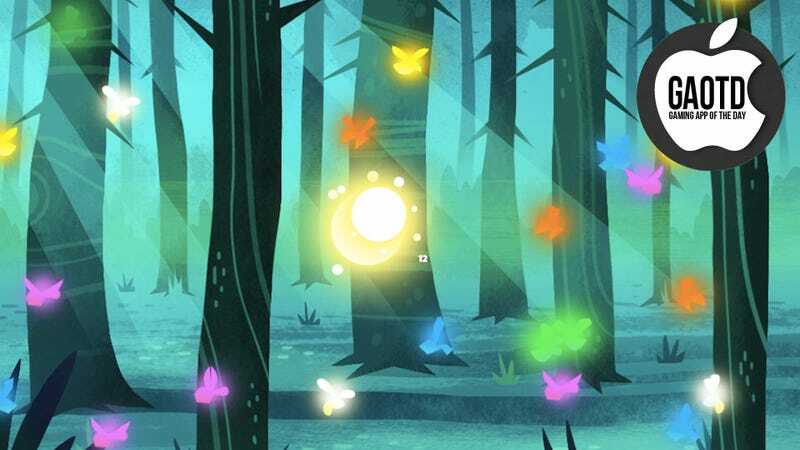 Once a firefly has become a ball of light, it vanishes—in a less kid-friendly game, you would be making the fireflies explode. Here, you're "shining your light on them." Your goal is to light up a certain number of the available fireflies in a scene. Fireflies light up differently according to their color—for example, blue fireflies' globes stay lit for an extended period of time, orange fireflies blast smaller globes around the screen, and gold fireflies trigger a much larger ball of light. You only get one tap per level, but if you play that tap right, you'll see a chain reaction of light-globes bouncing around the screen as your number climbs and climbs. As the fireflies light up, small chimes and other musical instruments play, and every note is in tune with the placid background music. It's all very calming. Fireflies! isn't exactly "difficult"—most levels that I've failed I've passed on the next couple of tries. And the input required is so minimal—one tap!—that it never feels particularly straining or stressful. But that's the point. It's simple enough for a child to play, but it's satisfying enough on its own merits to attract more sophisticated players. I was recently out in Minnesota to visit family, and while I was there, I realized that I'd spent too long away from the many pleasures of Midwestern summer. We don't really have summer in San Francisco, and while that means we don't get crushing heat and humidity, it also means we don't get to wear sandals, and go swimming in lakes, and drink cool beer in the evening and watch fireflies. Fireflies! doesn't quite replicate that feeling, but it is an enjoyable game with a soothing, satisfying mechanic at its core. I'll take it.